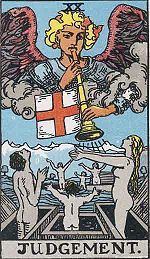 Angel Gabriel emerges from the clouds of heaven, blowing seven notes from his trumpet, giving humanity the creative Word that connects us to the Divine. Attached to the trumpet is the equal-armed solar cross, reminding us to seek balance in all we do. In the foreground of the Key is the pool of Cosmic consciousness, where all the streams we’ve seen in previous keys (beginning with melting snow in The Fool key) flow together to become One. Note the same snowy mountain-tops from The Fool key in the background. This is yet another of Tarot’s attempt to help us find connection and balance in our lives. The man, woman and child rise from coffins of world beliefs floating on the pool. This is the re-awakening of our connection to Nature through Spirit and of our connection of birth through death. The man represents the conscious mind, the women the unconscious, and the child represents our ability to regenerate through many lifetimes. Numerologically, Key 20 represents our evolution through two complete cycles of 10, being renewed and reborn twice in the cycles of learning who we are physically, emotionally, mentally and spiritually. The Judgement Key is about the gift of discernment that comes from living successfully through challenges and obstacles in our lives. Here, finally, The Fool has found the secrets of living a full and joyful life through both knowledge and faith. The Fool now stands on the edge of blending with universal thought. Hello Deb! Could this card be a representation from spirit of their transition to the other side? I’m not sure why, but I had this thought pop into my head and the urge to explore it. I thought you’d be the right person to ask. Thank you for all the wonderful guidance you bring through your teachings, I’ve learned so much from you.